Chris has been chosen by his peers to be honored as a Star of Life for his commitment to his patients and his community. 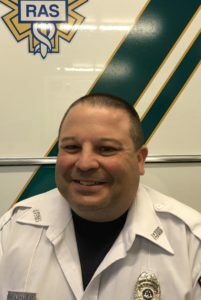 A dedicated EMT for Regional Ambulance Service for the past 14 years, Chris always provides exceptional patient care. Chris is also a loyal employee who goes above and beyond our expectations and is consistently compassionate towards others. No matter how difficult the situation may be, Chris not only treats the medical needs of his patients, he also exhibits a positive attitude and is uplifting and caring to everyone. Chris is well known for his exemplary caring behavior to his community—in addition to working with Regional Ambulance Service, he has volunteered at his local fire department for 31 years.